Spring is a great time to start anew, much like the green allies in our gardens this month. Many people try to eat better at this time of the year; some eat simply, others give up drinking alcohol for a few weeks or add bitter spring greens to their diet such as dandelion. Basically, they’re all trying to give their sluggish liver a lift after a slower–paced winter. Our liver performs many essential tasks including filtering harmful substances out of the blood (including alcohol), storing vitamins and minerals, producing cholesterol, bile, certain amino acids and urea, maintaining proper blood glucose levels, converting glucose to glycogen to name a few. Just how can we nourish and support our livers so they continue to function optimally? polymerase A, which results in the regeneration of the liver by increasing protein synthesis, leading to the growth of new cells. 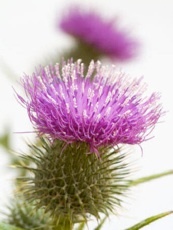 Studies conducted in Europe have shown milk thistle to be effective in treating mushroom poisoning, cirrhosis, jaundice, hepatitis and liver damage as a result of alcohol or drug abuse. Matthew Wood classifies milk thistle as a spleen/lymphatic remedy, acting secondarily on the portal and hepatic systems. The Commission E report from the German government recommends milk thistle seeds for the treatment of all liver dysfunction and distress, but the benefits of milk thistle seeds play an amazing preventative role protecting your liver from a polluted environment, excessive drinking, chemotherapy, chemicals you may encounter (paint, chlorine, varnish, dry–cleaning chemicals, etc. ), and over–the–counter, prescription or recreational drugs. Taking milk thistle before being bombarded with any of these substances is highly recommended. One of the easiest ways to sneak milk thistle into your diet is to fill a spice grinder with the seeds and leave it on your table. Grind them liberally over rice, cereal, stir–fries, soup, salads or yogurt! They have a slightly nutty flavour, a very mild and delicious taste. You can also buy a milk thistle seed tincture and take anywhere from five to thirty drops, in a jigger of water, twice per day. Spring is a great time to nourish your liver, but ideally everyone should treat their liver to milk thistle for a month or two every year knowing how positive the outcome will be!